We ring in the new year with blood orange margaritas, combining the winter citrus with tequila, lime and triple sec to create damn tasty cocktails. This drink is my vacation. I think I’ve mentioned before that Matt and I have our New Year’s Eve ritual down to a science. Or an art. An art sounds better, doesn’t it? We make a fancy appetizer, steam lobsters, buy the crispiest french fries we can find and eat it all on a messy table lined with newspapers and butter drips. Heaven. 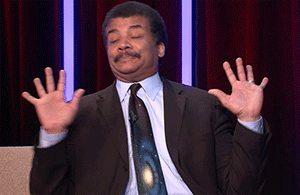 But this year we wanted to mix it up a little (imagine a middle-aged person doing jazz-hands when I say “mix it up” so you won’t be disappointed by what I mean). We still made lobsters and fries, of course (why mess with perfection? ), but we went totally off-script with our beverage (that’s one of Matt’s hated words so I must use it as often as possible). 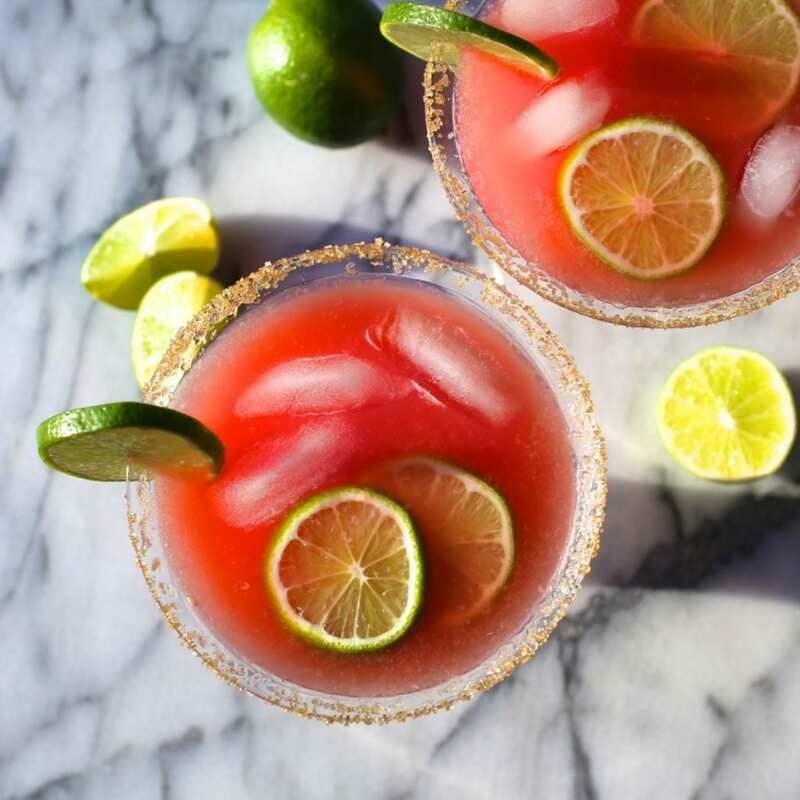 Instead of the usual Champagne or Prosecco cocktail, we made… brace yourselves … Blood Orange Margaritas. See, we had this lovely bottle of silver tequila that had been sitting, untouched and probably getting resentful, in our liquor cabinet next to the much more frequently used gin and vodka. So margaritas had been decided upon a few days ago. But it wasn’t until we were shopping yesterday that I found an ingredient on sale that I just could not resist. Freshly squeezed blood orange juice. Of course you could buy blood oranges and juice them yourself but my motto on NYE (and in life) is the easier the better, thank you very much. Use a decent white or “silver” tequila. Blood oranges are in season from December through May, though the exact months vary depending on what type of blood orange you’re buying. The Moro variety is available from December through March, while the Tarocco is available from January through May. Both are delicious and easy to find if you can’t find pre-squeezed juice. 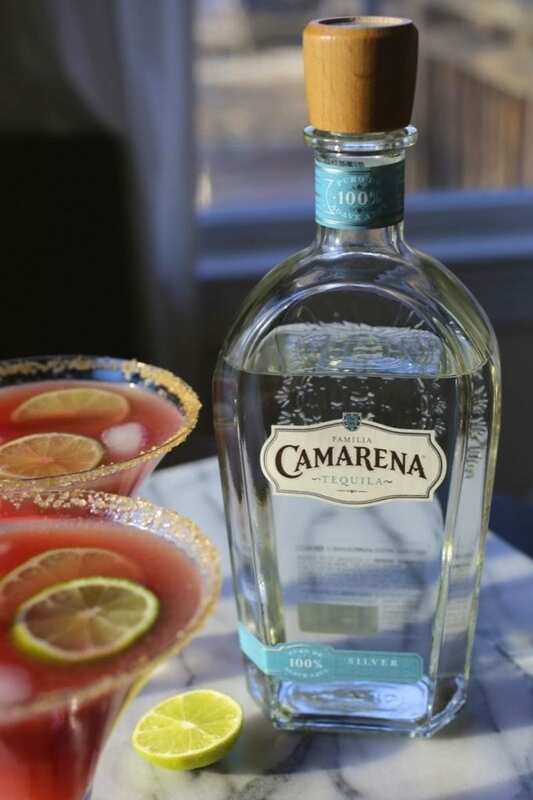 Bottled or fresh juice will work to create seasonal blood orange margaritas that you can shake up to enliven a party. We rimmed our glasses with Turbinado (raw) sugar but a salt rim would also be delicious. 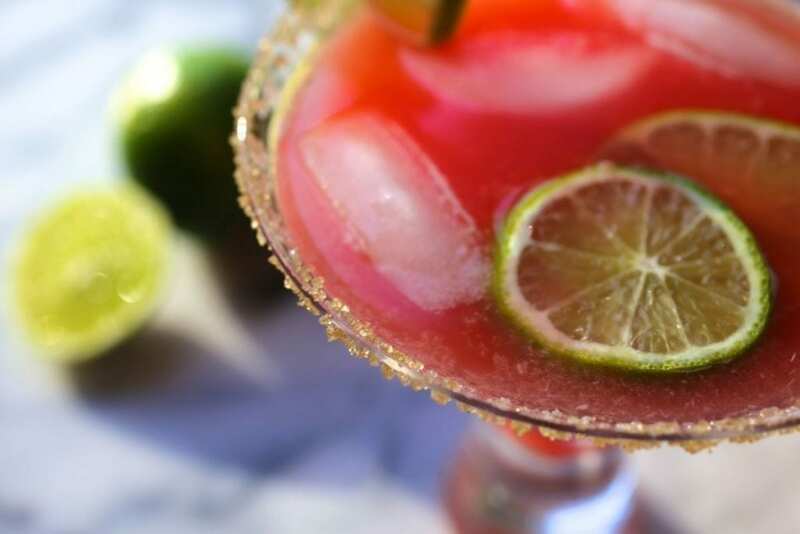 Combine the tequila, triple sec, lime juice, and blood orange juice in a cocktail shaker. Fill with ice and shake vigorously for 15 seconds. Strain over ice into chilled glasses rimmed with turbinado sugar. Garnish with lime wheel and get ready to make a second batch. 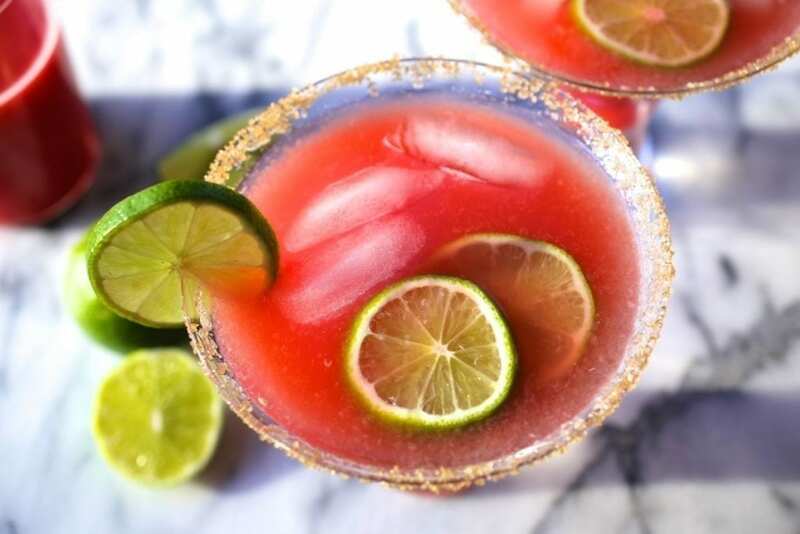 To sugar (or salt) rim your glasses, run a lime wedge lightly over the rim of each glass and dip into a bowl with a few tablespoons of sugar in it. Allow a few minutes to dry before pouring drinks. These drinks sound like they’d be delicious, and your photos are beautiful! These are such gorgeous pics!! 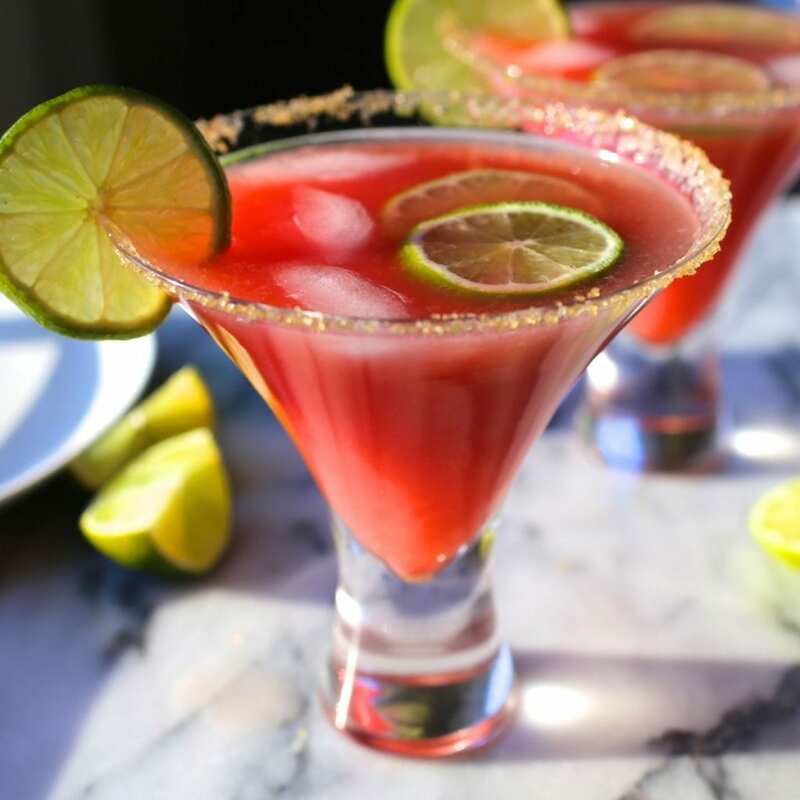 Wish I had one of these margaritas in hand right now.. they look refreshingly delicious, perfect for the summer weather here in australia too. Oh my gosh it’s 2015?!? Hahaha love this recipe! Can’t wait to try!